Busted:The Real Truth about Makeup Removing Wipes and Cleansing your Face! Wipes seem to be the easiest and quickest way around to clean skin. But is that for real? Discover the real truth behind wipes and what they do to your skin. Cleansing Myth 1 – Makeup Removing Wipes are Best for getting your Makeup Off! When you reach home at the end of the day and need to get off your makeup in a jiffy – wipes might look like the best answer! Truth is, after you wipe your face ‘clean’ with a makeup removing wipe, you’ve only just shifted around a part of the makeup, warn skincare experts. Left on overnight, this easily clogs up your pores that are trying to breathe. Result – outbreaks, acne and dull skin over time! Cleansing Myth 2 – Makeup Removing Wipes Clean Instantly! If it seems like these wipes are your best friend when you’re at work or on the move, think again. Instead of cleansing, all they do is move and shift the grime around your face! While they contain emulsifiers that help lift your makeup, ‘no need to rinse with water’ means they leave behind a part of the grime. So, it seems like you’ve cleaned but what you’ve actually done is moistened and reorganized some of your dead skin, makeup, dust and other nasties – making them more prone to absorption by your skin! Cleansing Myth 3 – Makeup Removing Wipes are Soothing! Just because cold feels refreshing, doesn’t mean these chemical laden synthetic napkins are soothing for your skin! On the contrary, dermatologists warn that every time you wipe – you’re transferring some of those harsh chemical cleansers and perfumes onto your skin. Since you’re not rinsing these away, you’re exposing your skin to high levels of alcohol, propylene glycol and other skin irritants – leading to dryness and early ageing. The Real Truth about Makeup Removal Wipes! 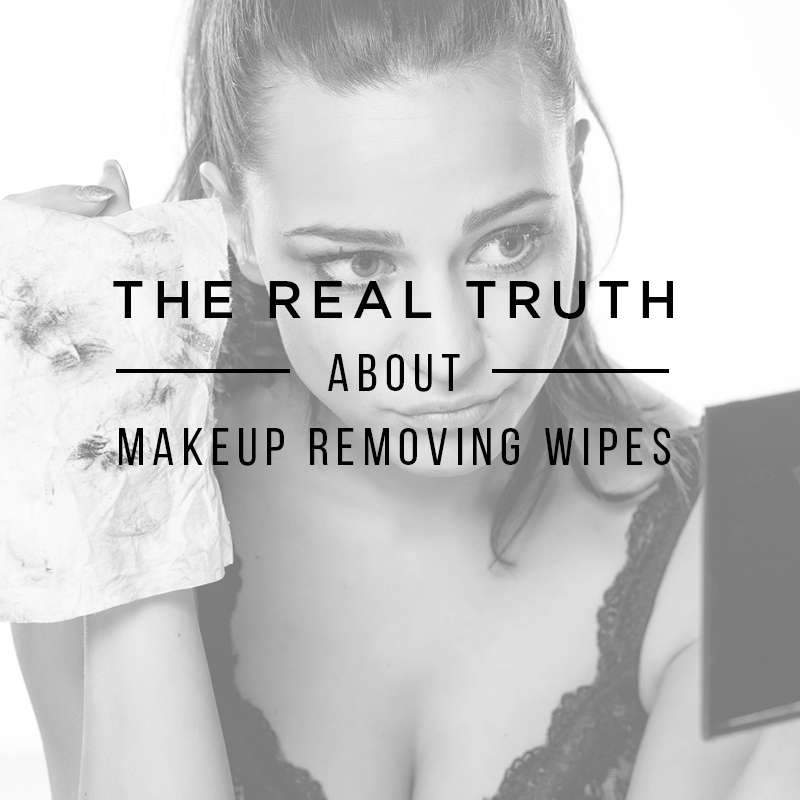 So my dear ladies, truth is – Makeup wipes don’t actually clean your face! If you’re looking for clean, healthy, glowing skin; spend time cleaning your face every night with a gentle non-foaming cleanser and rinsing it away with water and a nice facecloth. And for best results – double cleansing is the way to go. Cleanse one – to remove your makeup. Cleanse two – to deep clean your skin. If you really love your skin and your many pots of skincare creams, stay away from facial wipes. Because only a clean palette can fully absorb those skincare goodies on your dresser!